Editor: I updated the chart to coincide with the S&P 500 breaking the nominal closing price record on March 28, 2013. Yes, the DJIA is still at a record high – as of the 28th, you’d be up 7.5% if you invested at the peak and reinvested dividends. We’ve seen an inordinate amount of attention paid in the last few weeks to a pretty goofy indicator – the Dow Jones Industrial Average. The Dow Jones Industrial average consists of 30 subjectively picked stocks which best represent ‘large, publicly owned’ American stocks. Of course, the DJIA itself is a bit of an anachronism, as most of the stocks the DJIA tracks aren’t actually Industrials. Furthermore, it uses a strange calculation called price weighting, an arbitrary system which gives the most weights to companies which have higher trading prices, without regard to volume or float. Is the Dow Jones at an All Time High or Not? My issue with the whole mess? The DJIA recently broke through its all time high price, creating lots of happiness at financial publications. Of course, the cynical amongst the financial press instantly pointed out that, adjusted for inflation, we were actually still 12% below all time Dow highs. Well, it’s time for me to come knock some heads – yes, we’re at an all time high on the Dow Jones. However, we all missed the boat. 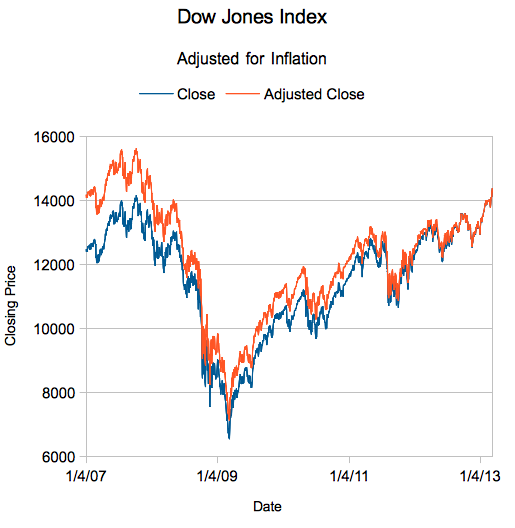 By my calculations, the Dow Jones last peaked, inflation adjusted on October 9, 2007. We briefly cracked its value on October 5, 2012, and we have been in the green every day since January 11, 2013. I updated this picture on March 28 for the S&P Nominal High. How Are You Calculating the Dow Jones Industrial Average Total Returns? Elementary, my friends – first, I grab CPI-U, seasonally adjusted, from the St. Louis Federal Reserve (tabulated by the BLS). For dates before 1/1/2013, I do linear interpolation to determine a ‘daily CPI’. After the 1st, I extrapolate from 11/12, 12/12, and 1/13 numbers to come up with a daily price (I did this on Saturday, March 9th – no February numbers were available yet). Next, I skip the Dow Jones Average. Folks, one of the hallmarks of the largest companies in the United States is they happen to have pretty decent dividend policies. That means that any reference to price returns on the Dow Jones Index is a dodge – most of you, if you are investing in the DJIA, are reinvesting your dividends. 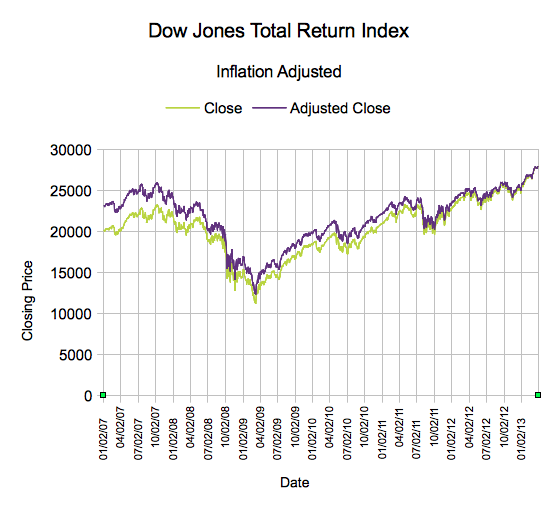 Luckily for us, dividend reinvestment is already calculated into one version of the index – enter the Dow Jones Industrial Average Total Return Index (warning: PDF). This chart does only half the work. It might seem like a minor point, but it’s absurd to toss out dividend yields on Dow stocks. As of today, Index Arb reports the dividend yield to average 2.81% on DJIA components. I’ll never understand why the financial press refuse to factor in dividends – whether received or reinvested. I know what you’re thinking – is there still a shortfall to looking at it like I’m looking at it? Yes, but it’s impossible to quantify (making this analysis superior). You can’t invest directly in an index, so you have to deal with transaction fees and tracking errors if you invest in a Dow Jones fund in real life (or make your own through options, futures, or other instruments). Also, depending on where you invest, you might also owe taxes – and unlike here on DQYDJ, the IRS ignores the effects of inflation for capital gains and dividends. So, I make no apologies for being annoying on this topic – I believe if you’re going to invest or look at long term returns, you need to look at the effects of reinvestment (I consider DQYDJ the gatekeeper on this – see our calculator on the S&P 500 and the 10-Year Treasury Note). Price return isn’t so great of an indicator, considering that if you are in the market long enough, the effects of dividends will start to outweigh all other factors in your return. So, join the charge – let’s not let the mainstream financial press be lazy about this one, eh? If an engineer with a spreadsheet program can figure it out, so too can you, major publications! I like your perspective on whether its at an all time high or not. I’ll stick to my guns on one thing though. Perception is that it is at an all time high and money will be taken off the table. I’m not sure how much money is waiting on the sidelines to keep it propped up (probably quite a bit) but I think it is prudent to protect and consolidate your gains (assuming you’ve been investing all along). Although, at another level, stocks tend to continue to set all time highs over and over… I don’t know how to quantify that, but maybe I’ll take a shot at it in a future article? “So, join the charge – let’s not let the mainstream financial press be lazy about this one, eh? If an engineer with a spreadsheet program can figure it out, so too can you, major publications!” Great point! But then again, how would the screaming pundits on TV get their ratings and people to watch?! 😉 I think, in general, they’re much more interested in headlines & fluff than actually giving substance to their arguments. Good post! Perhaps i should be a screaming pundit on TV? I think my in-built sarcasm doesn’t come across well on the big screen, though. I’ll stick to podcasting for now. They shouldn’t just ignore the dividends of course. But its probably simplest just to report the index itself. If they did report dividend impact wouldn’t they have to have a consistent way to do so? I mean its not a given people reinvest dividends so do you automatically assume they would do so or do you account for returns if people do / don’t reinvest? Maybe this ambiguity is part of the reason they just don’t go into the dividend portion of the return? I don’t know, I’m just wondering out loud. You underestimate the power of engineers with spreadsheets and/or overestimate the power of major publications. Haha, yeah, reporting the index is the simplest. It took me two hours to do this because I didn’t know how to do ‘Interpolate’ on OpenOffice. I think I would have been fired for taking so long, heh. There is ambiguity, but let’s assume worst case – highest tax bracket, you spend every dividend as it comes to you. If you held from 2007 until today you still would have pocketed 85% of the dividends. I consider we have a closet industry of blogs obsessed with “dividend growth” (I think that’s what they’re obsessed with) and I figure we ought to make the comparison fair. By the way, by my math, it goes up to 100% if you pick up R (http://www.r-project.org/) or another stats package. I think I invented this: In Mathematica Veritas. Like it? Great point about being technically correct. But it doesn’t make for must see TV. Fight the power and maybe you should be a pundit, haha! Here’s a theoretical – if I join the chattering class, does that make me a chatterer? Do I become part of the problem? I love dividends. But I’m undecided about whether they should include them or not, since the dividends may or may not have been reinvested depending on the prefernces or needs of the investor. Currently, I reinvest all of my dividends, but in the future I hope to be able to live on them – at which point the reinvestment will stop or at least be substantially tapered down. You buy a stock yielding 4%, perhaps even because it was yielding that (heh). After 10 years, you sell it for 0 capital gains. Did you gain no money? Even if you took all of the dividends out, you still made $40 in gains from the purchase of the stock – we should attempt to account for it, even if we don’t plow it back into buying more. On a personal note, I tend to let dividends drop into my account for a bit (not scientific), then when I contribute more I’ll use them to buy into a stock. When I do my XIRR calculations it makes it easier since the dividends then don’t leave the account.